Here I have one of the many delicious brews I took home from my trip to Dark Lord Day which I will elaborate on in the near future. Piece Brewery & Pizzeria is a lovely brewpub in downtown Chicago that serves a variety of tasty brews (many of which have won awards) and some pizza that smelt fantastic (thought I never managed to make it there with an empty stomach). 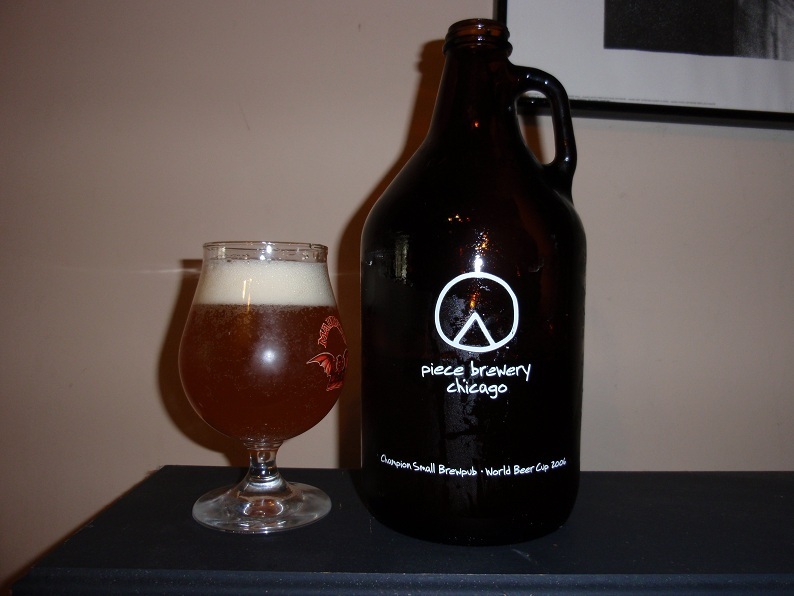 After enjoying a number of pints of Dysfunctionale which they call an American-Style Strong Pale Ale on their web site (though I swore their chalk board said IPA) both nights we were in Chicago I couldn’t help but bring a growler home to share with my friends and write about. While there I also tasted some of a smoked Stout, a Strong Ale and bought a pint of their Marketing Ploy a hilariously named IPA collaboration with 3 Floyds; all of which were very nice. Pours a bright apricot hue that is very opaque but not overly hazy. Two fingers of bright white head are easily formed even with the growler being filled from the tap two days ago and the cap simply taped sealed. Smells strongly of fruity and floral hops, I’m betting Cascade and Centennial and perhaps some others, as well nice earthy tones. I find the aroma absolutely fantastic with orange esters playing with grapefruit and other citrus and a decent but subtle dose of bitterness in the nose. Flavor is smooth and malty upfront which is a wonderful base to balance the serious dose of citrus hops which largely contribute grapefruit and orange for me with some clean earthy notes that give additional character. Decent sweetness from the malt contrasts the solid bitterness very well giving this ale wonderfully clean bitter hop esters. Body is medium and the mothfeel is very smooth and clean. A few sources on the web suggest this brew is 6.5% ABV and that seems about right. I would confidently say any fan of hoppy Pale Ales or IPAs will enjoy this brew. If your in or near Chicago I highly suggest you check it out, and bring your bike; so long as your not scared of the crazy traffic.